19.00 hrs. – 23.00 hrs. No doubt Antwerp is the most baroque city in the Low Countries, where people live and where life is exuberantly celebrated. Still, there is only one real baroque church left: Saint Charles Borromeo. Most medieval churches, of gothic architecture, have only a baroque ‘garnish’, but one that counts: the furniture and the decoration, the liturgy and the music! The emerging Protestantism that emphasizes the hearing of God’s word resulted in a real iconoclasm in the middle of the 16th century, to the great sorrow of Catholic Antwerp. The Catholic Church is convinced that it is also possible to meet God tangibly in the sacraments and would like to celebrate this joyfully as a festive event. From the end of the 16th century onwards, the Gothic churches were once again colourfully decorated. And with Rubens in the lead, the regained self-awareness of the Catholic Church in the 17th century enabled a true triumphant Baroque style. And this is not only apparent in the altar paintings, but in all the abundant church furniture: exquisite altars, refined choir stalls, instructive pulpits and confessionals and playful organ cabinets. Even when not playing, the organ is able to bring you into a musical mood. High up against the walls and ceilings, painters and sculptors even want to open up the doors of heaven. By the way, the whole church looks a bit like a heavenly party room, because meeting God can be a party! The liturgical services are not limited to regular masses, but on occasion develop into theatrical manifestations with special effects, magnificent occasional decorations, parades and theatre. All this had to make tangible how beloved Jesus, Mary and the saints are. No expenses were spared. An excess … that began to hurt. It was not until the French Revolution and again in the 1960s that this ‘rich Roman life’ came to an end. For the critical self-awareness of the West, any triumphalism was out of the question, especially that of religion. Soon Catholic self-awareness melts like snow for the sun of the Enlightenment and secularization. It seemed as if faith could no longer be celebrated. We crawled back into the enclosure as if there had never been an initial Pentecostal miracle. 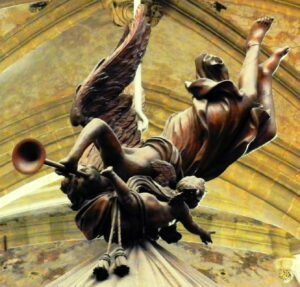 Fortunately, here and there – not least in Antwerp – echoes of the ‘Baroque’ festive rumble within the Church continued to live, especially through singing and music. The organ playing remains to this day. Sometimes there are aftereffects or even reappearances of Gregorian solemnity. As long as the quality of one’s own choirs allows it, one is fortunate, but many have already collapsed or are threatened with extinction. The orchestral masses in the Saint. Paul’s Church and the artists’ masses in the Saint Charles Borromeo’s Church are a high exception. The typical sensory, festive character of the ‘Baroque’ has led to the fact that this concept not only refers to the style of Rubens’ 17th century, but also in a broader sense to ‘exuberantly festive’, ‘playfully imaginative’, ‘abundantly decorative’ – ‘there is no limit’. In this sense it is used by the cultural festival ‘Baroque 2018 – Rubens inspires’. 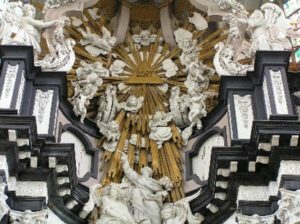 In the Baroque year 2018, not only the Baroque churches will be of the party. Also, churches in a different style have something of ‘baroque’ in them, festively dressed as they are. Through almost every organ pipe also sounds music. In the table below, the link on the name of the church leads to the detailed description of the church or to general information. The link on the address of the church leads to the program during the Night of the Churches. (Sorry, Dutch only). Admission is free. Everyone is most welcome. Guides are on site. The ‘Night of the Churches’ is organised by the non-profit organisation Tourism Pastoral Care in Antwerp (TOPA). Also refer to the other sections of this multilingual website with extensive cultural-historical information about the Antwerp churches.